Sometimes a product may be out of stock in your store when customer needs it. You probably don't want customer to leave as he is ready to make a purchase. You might ask a customer to visit your website and make an order online or to come back to your store later. But why not let him make a preorder in-store? Facelet lets you to accept preorders. Follow these few simple steps to start collecting orders from your in-store kiosks. 1. Go to Devices, choose one of your kiosks and open its settings. 2. Scroll down to the bottom of settings to find Enable Checkout toggle. 3. 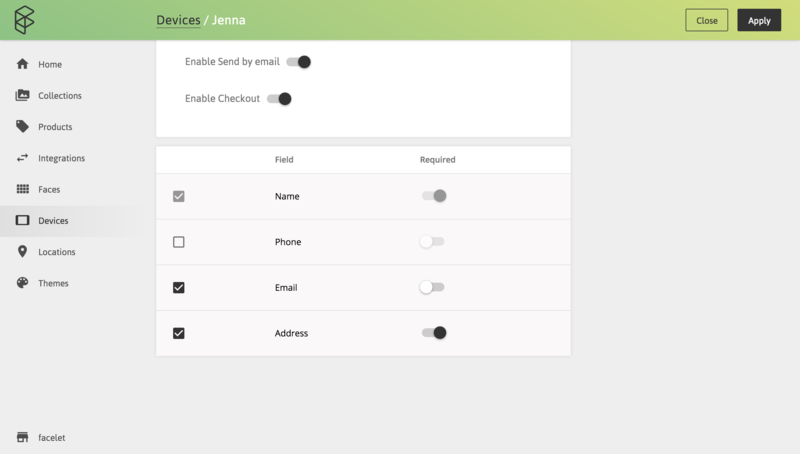 Swith Enable Checkout toggle on to see available field options for checkout process. 4. Flag fields that you want your customers to fill out during checkout process and mark required ones. Note, that Name field is required by default and you can't remove it from checkout process. 5. Save device settings by clicking Apply button.